Ugh! A perfect berry is ruined! The birds love all kinds of berries and will eat your strawberries faster than you can imagine if you don’t protect them. I bought two nets this year. The white net is from Joann. After I bought it I quickly realized that it wasn’t big enough since the strawberry patch has mutated beyond belief this year. So I bought the green net at Hobby Lobby. There’s no special reason for buying green. It was the same price as the white so I thought it would be fun to get something different this year. You can buy this netting at any crafts store that sells fabric. Walmart used to sell fabric but I heard they are phasing it out now. Get the netting that is the cheapest per yard. It doesn’t matter if it is scratchy – it won’t be rubbing on your legs! It also doesn’t matter how small or large the netting holes are. Your goal is to keep out the birds so as long as the holes aren’t big enough for a bird to get through, it’s fine. I only use my nets for one year and then I throw them out at the end of the season. They get torn and muddy from the rain and are just plain worn out by the fall. I would like to build something that will last multiple years, but until I get around to that, this net works just fine. 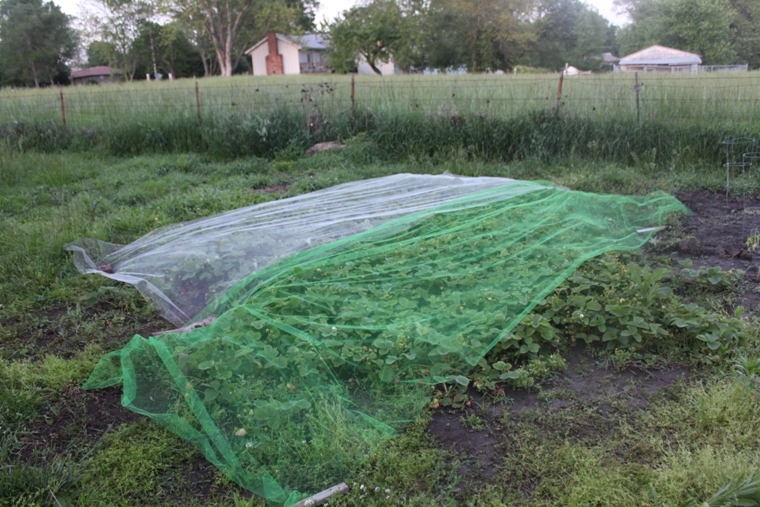 The size of your net should be a little larger than the size of your strawberry patch at the beginning of the season. 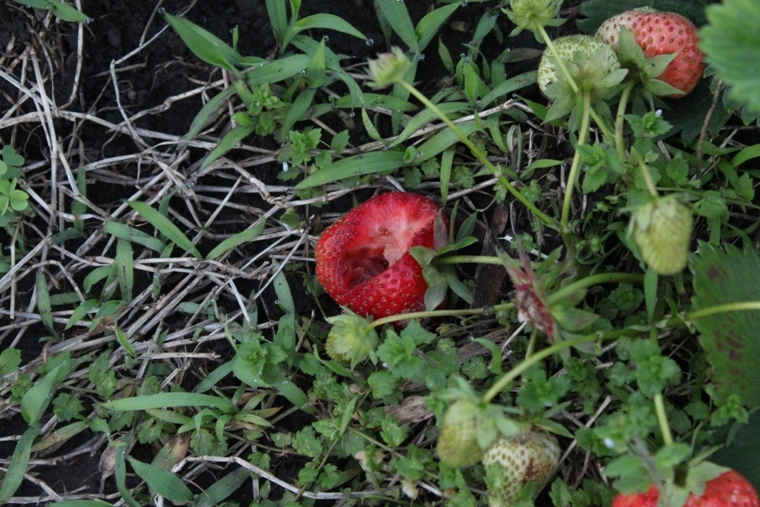 Strawberries put out runners that set new plants. That’s how the patch expands. So your patch should grow larger during the season, which is why you need a slightly larger net. Both nets in the picture above are from 72 inch bolts. In case you don’t sew, a bolt is the how the fabric is organized at the store. It’s wrapped around a piece of cardboard and you cut off how many yards you want to buy. Well you don’t but the fabric store lady does. The size of the bolt tells you how wide the fabric is on the bolt. Some are 45 inches wide, 60 inches wide, or 72 inches wide, in the case of the nets I bought. I wanted the largest nets possible so I could cover the mutant strawberry plants. The white net is 6 yards long and the green net is 7 yards long. And it still doesn’t cover all my plants! I will probably have to get another net later in the season, or else just sacrifice the berries around the edges to the birds. This net system works really well for me. If anyone else has any ideas for protecting berries from the birds, please share in the comments! I have a similar problem only I’m pretty sure its turtles…..argh! Although I’m still getting good strawberries!